Diana knew that I wanted a CB Radio for my motorcycle so she set out on a mission to buy me one for Christmas. Through her research she found the Cycle Accessory Store owned and operated by Mark & JoAnn Thompson in Franklin, North Carolina. The purchasing process was intimidating because there are so many different components but Mark helped Diana through the process. Diana told Mark what kind of motorcycle I had and he made sure that she bought all the right parts that would mount to my motorcycle. Diana says Mark was “very nice, very friendly, very knowledgeable and very helpful”. The CB arrived in time for the holiday and I was floored when Diana gave me such a nice gift! A week later after we returned from our Christmas getaway to Florida I told Diana I had changed my mind and would like to return the CB Radio. She was devestated after all the effort she invested in putting together the perfect gift. Our situation had changed so my priority changed. In the past Diana rode pillion on long trips and I wanted to be able to communicate with the Road Captains on Ulta Classics. Diana has since made it known she will be riding her own bike on future trips. Now my priority will be to communicate with her via a hands free bike to bike communication system. 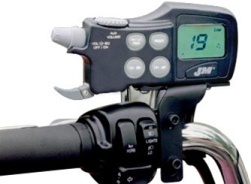 I called JoAnn Thomson and asked her a ton of questions about different motorcycle bike to bike communication systems. She was a wealth of knowledge and super helpful. I decided I would like to buy two Chatterbox communicators in the spring which would cost about $600. Now came the true test of customer service: I wanted to return the $588 CB Radio a full month after Diana purchased it, and I wanted a full refund now! Mark and JoAnn said “No Problem” as long as the items are still in the original packaging. When buying accesories on the Internet I believe the true test of a company is the ability to return products for full refund. The Cycle Accessory Store passed with flying colors! I packed the CB Radio using styrofoam peanuts. I shipped it from The UPS Store making sure to choose signature required and to insure the package for the full value of the contents. I e-mailed Mark that the J&M CB was on its way back and if for any reason UPS damaged the package that he should not open it. That he should call UPS to file the damage claim for me. It cost me $27 to ship the package and it arrived perfectly in three days. Several days later Diana received a full credit on her credit card! Cycle Accessory Store specializes in motorcycle communication, audio and stereo equipment. Mark and JoAnn serve up good ole fashioned one on one customer service. They provide personalized assistance over the phone. They return calls promptly too. They back up their products 100% and they know what they are talking about! They certainly earned the RC USA stamp of approval!